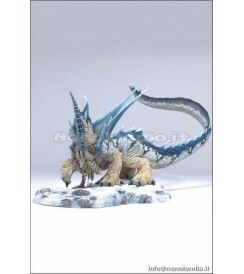 Ice dragon measures 16 inches from head to tip of fully extended poseable tale. Top spike on back measures 4 ½ inches tall. Ball joint at neck; also articulated at shoulders and hips. Custom ice base includes miniature human figure.